The Diary of Anne Frank is one of the most famous and haunting stories to emerge from the 20th century. The memoirs of this young Jewish girl, forced to hide with her family for nearly two years to escape Nazi persecution, are an essential part of how we remember one of the darkest periods of our human history. 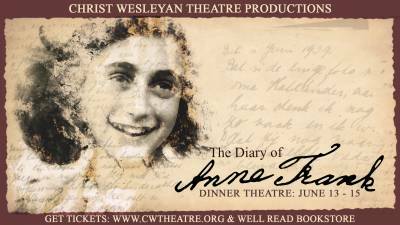 This play draws from previously unpublished parts of Anne Frank’s real-life diary, allowing the audience to experience Anne in a way that breathes life into this passionate, complex young woman, allowing us to share her relatable experience of adolescence as a familiarly modern teenager. Tickets available at http://www.cwtheatre.org and The Well Read Bookstore. Your ticket includes a reserved table seat, a fully catered meal, cake, coffee, and, of course, the performance. There is a brief intermission. Dinner theatre tickets must be purchased in advance by Monday, June 3.